Draft: 2001, Milwaukee Brewers, 2nd rd. Originally selected in the second round of the 2001 First-Year Player Draft by the Milwaukee Brewers and signed by Brewers scout Brian Johnson…Is a 2001 graduate of Sabino (AZ) High School...Was an All-State selection from 1999-2001 and an All-American selection in 2001...Member of the USA Junior National team that won the silver medal in Edmonton, Alberta, Canada in 2000...Played for the USA Olympic Qualifying Team in 2003...Appeared in an episode of "The Young and the Restless" in 2007 (aired on 6/20/07)…Married, wife's name is Adrienne…She was a softball player at the University of Arizona…The couple has a son, Jay Jax. Hit career-high 30 homers, becoming third O's shortstop to hit 30 in a season (Ripken in 1991 and Tejada 2004) ... Tied his career-high with 80 RBI (also Milwaukee in 2007) ... Named AL Player of the Week, August 8-14 ... Tied with Colorado's Troy Tulowitzki for most homers by shortstop (30) in the majors ... Led AL shortstops with a .990 fielding percentage, 4.92 total chances per game, 3.2 assists per game and range factor pergame (4.76) ... His .491 slugging percentage led AL shortstops ... From June 1 through the end of the season, tied with Albert Pujols for the third-most homers in the majors (28) behind MarkReynolds (30) and Dan Uggla (29) ... His 57 extra-base hits were 25th in the AL and second on the club behind Mark Reynolds' 65 ... Drove in a run in eight straight games August 2-12, the fourth longest streak in Orioles history and longest since Tejadacollected an RBI in nine straight from April 8-17, 2005 ... Had 16 go-ahead RBI and seven game-winning RBI ... Tied his career-high with four hits August 10 against Chicago ... Batted .338 over a 35-game stretch from May 21-June 30 with 10 doubles, nine homers, 20 RBI and 24 runs scored ... Hit nine home runs in June, the second most by a shortstop in franchise history behind Miguel Tejada's 10 in August 2007 ... Hit four leadoff home runs (June 7, June 10, July 5 and July 28), the most in a season by an Oriole since Brian Roberts hit four leadoff homers in 2005 ... Hit in 13 straight games August 17-30, going 20-for-59 (.339) ... Homered in consecutive games June 1-3 ... Hit home runs in his first two games batting in the leadoff spot June 7 and June 10 ... Hit grand slam May 15 at Tampa Bay ... Hit first home run as an Oriole May 10 against Seattle ... Homered in nine consecutive series, May 30-June 29 ... Reached base safely five times on June 10 against Tampa Bay ... Had a stint on the disabled list with a strained left oblique April 10-May 9 ... Batted .351/.397/.509 with 2 HR and 10 RBI in 57 spring at-bats (19 games) ... Signed a three-year contract extension through 2014 on July 18. Made 110 starts for the Brewers, all at shortstop...recorded his 500th career hit, June 26vs. San Francisco with a solo home run off Matt Cain...seventh career four-hit game, June 29 vs.New York (NL)...batted .229 (85-for-371) with 11 home runs and 45 rbi in 102 games before beingoptioned to Triple-A Nashville, August 12...batted .254 with four home runs and 12 rbi in 18 games...acquired by the Twins from the Brewers in exchange for Carlos Gomez, November 6. Made 143 starts at shortstop for the Brewers...named National League Player of the Week, June 30-July 6...season-high 16-game hit-streak from June 11-July 4...back-to-back four-hit games, July 3 at Arizona and July 4 vs. Pittsburgh...fourth career two-homer game, July 6 vs. Pittsburgh...walk-off rbi-single in the 11th inning on September 5 vs. San Diego...set career-highs in batting average (.283), doubles (31), triples (4) and walks (52)...became just the third player in franchise history to hit 20-or-more home runs as a shortstop in two different seasons (Young in 1980 and '82 and Jose Hernandez in 2001-'02)...ranked second among Major League shortstops in home runs and third in rbi. Batted .242 with 5 HR and 14 RBI in 35 games.....made29 starts, all at shortstop...Was one of five Brewers (Hall, Miller, Clark & Fielder) tohomer in the fourth inning on 4/22 vs. Cincinnati.....wasthe fifth time in Major League history that a team hit fivehome runs in one inning.....Hardy hit the fourth home runof the inning...Produced a season-high 3 hits on 4/8 vs. Arizona, 4/15at New York-NL and 4/20 vs. Cincinnati...Had a season-high 4 RBI on 4/29 at Chicago-NL...Left the game on 5/16 vs. Philadelphia with a sprainedright ankle.....suffered the injury sliding into catcher SalFasano on a play at the plate...On 5/17 was placed on the 15-day disabled list with asevere sprain of the distal deltoid ligament in the rightankle...Prior to the injury had 1 hit in his last 16 at-bats (.063)and 6 hits in his last 40 at-bats (.150)...On 7/20 underwent season-ending surgery (Dr. WilliamRaasch).....underwent a retinacular repair to stabilize theperoneal tendon in his right ankle...Was transferred to the 60-day disabled list on 7/29 andreinstated on 10/31. Became just the fifth Brewers player to make his Major League debut in the Opening Day starting lineup, joining Paul Molitor (1978), Robin Yount (1974), Gorman Thomas (1973), and Pedro Garcia (1973)...Was one of two rookies on the Opening Day roster joining pitcher Jorge De La Rosa...Hit .187 in the first half with one homer and 19 runs batted in compared to .308 after the All-Star break with eight roundtrippers and 31 runs batted in...Ranked second among National League rookies with 22 doubles and 44 walks, third with 50 runs batted in and seventh with 92 hits...Collected his first Major League hit, a two-run single, off Rick White on April 4 at Pittsburgh...went 1-4 in his debut...Began his Major League career hitting safely in his first three contests...Logged his first multi-hit contest on May 10 vs. Philadelphia going 2-3...Belted his first Major League home run off Randy Wolf in the fourth inning on June 11 at Philadelphia...Had a career-high day notching four hits, driving in six runs and belting his first career grand slam off Chris Booker on September 7 at Cincinnati...Recorded multiple hits in 17 games . . . drove in multiple runs in 12 contests...Recorded a .286 average (26-91) with one home run and 38 runs batted in with runners in scoring postition...Drove in the game-winning run with a walk-off pinch-hit single on May 9 vs. New York (N)...Logged .333 average (2-6) in the pinch...Hit safely in career-best nine consecutive games from September 5-20...His average stood at .359 (14-39) with two home runs and 10 runs batted in during the streak...Hit safely in 17 of his last 18 contests of the season recording a .329 average (28-85)...Plated 19 runs in his final 22 games...Posted just ten errors at shortstop for a .975 fielding percentage. Began the season with Triple A Indianapolis where he hit .277 with four home runs and 20 RBI in 26 games beforesuffering a season-ending shoulder injury in May...recorded an eight-game hitting streak from April 10-21...collected a season-best four hits going 4-4 on May 5 vs Charlotte...hit .345 in 14 home games belting four homeruns and driving in 15 runs...hit .348 in eight games in May before suffering a season-ending shoulder injury...suffered a torn labrum in his left shoulder on May 9...underwent arthroscopic surgery on May 28 in a procedure performed by Dr. Lewis Yocum. Named to the Southern League mid and post-season All-Star teams and to the Baseball America Southern League All-Star team in his first full season playing at Double A Huntsville...Put together his best all-around season offensively posting career marks with a .279 average, 12 home runs and 62 runs batted in...Had the first of two multi-homer games on April 6 vs Jacksonville...second multi-homer effort came on June 3 vs Mobile...Hit safely in 16 of 21 April contests batting .325 with four home runs and 13 RBI...Continued tear in May batting .306 with a homer and eight RBI...Hit in eight straight games May 28 - June 6 and added another eight-game hitting streak June 24 - July 4...Was 1-2 as the starting shortstop in the 2003 All-Star Futures Game on July 13 at U.S. Cellular Field...Collected season-high four hits (4-6) on August 12 vs Chattanooga...Posted a .970 fielding percentage making just 15 errors in 503 total chances...Named the third best Minor League shortstop by SportsTicker...Batted .256 with four RBI in 10 play-off games. Began season at Single-A High Desert, where he batted .293 with six home runs and 48 RBI in 84 games before a July 17 promotion to Huntsville, where he batted .228 with one home run and 13 RBI in 38 games (combined to hit .273 with seven homeruns and 61 RBI in 122 games between the two levels)...Played in the Arizona Fall League with the Maryvale Saguaros...Rankedas the sixth-best prospect in the Brewers organization by Baseball America entering the 2003 season. Spent his first professional season with the AZL Brewers and Ogden...Made his pro debut, July 21...Began the season inthe Arizona League, batting .250 (5-for-20) with one RBI in five games...Transferred to Ogden, July 27 where he hit .248 with twohome runs and 15 RBI in 35 games...Ranked 10th-best prospect in the Pioneer League by Baseball America...Ranked as theseventh-best prospect in the Brewers organization by Baseball America, entering 2002. MLB Superlatives: Who on the Orioles is the class clown, best dressed and more? 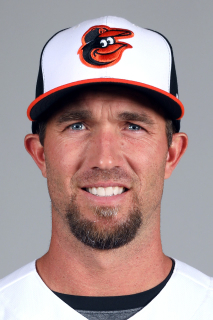 November 3, 2017 SS J.J. Hardy elected free agency. September 8, 2017 Baltimore Orioles activated SS J.J. Hardy from the 60-day disabled list. August 21, 2017 Baltimore Orioles sent SS J.J. Hardy on a rehab assignment to Norfolk Tides. July 31, 2017 Baltimore Orioles transferred SS J.J. Hardy from the 10-day disabled list to the 60-day disabled list. Right wrist fracture. June 19, 2017 Baltimore Orioles placed SS J.J. Hardy on the 10-day disabled list. Right wrist fracture. June 18, 2016 Baltimore Orioles activated SS J.J. Hardy from the 15-day disabled list. June 14, 2016 Baltimore Orioles sent SS J.J. Hardy on a rehab assignment to Bowie Baysox. September 8, 2015 Baltimore Orioles activated SS J.J. Hardy from the 15-day disabled list. May 7, 2015 Baltimore Orioles activated SS J.J. Hardy from the 15-day disabled list. May 4, 2015 Baltimore Orioles sent SS J.J. Hardy on a rehab assignment to Bowie Baysox. April 5, 2015 Baltimore Orioles placed SS J.J. Hardy on the 15-day disabled list retroactive to March 27, 2015. Left shoulder strain. May 10, 2011 Baltimore Orioles activated SS J.J. Hardy from the 15-day disabled list. May 6, 2011 sent SS J.J. Hardy on a rehab assignment to Norfolk Tides. April 13, 2011 Baltimore Orioles placed SS J.J. Hardy on the 15-day disabled list retroactive to April 10, 2011. Strained left oblique. December 9, 2010 Baltimore Orioles Traded RHP Jim Hoey to Minnesota Twins; Minnesota Twins Traded SS J.J. Hardy to Baltimore Orioles; Frederick Keys Traded RHP Brett Jacobson to New Britain Rock Cats and Rochester Red Wings Traded SS Brendan Harris to Norfolk Tides. July 3, 2010 J.J. Hardy roster status changed by Minnesota Twins. June 30, 2010 sent SS J.J. Hardy on a rehab assignment to Beloit Snappers. June 11, 2010 Minnesota Twins placed SS J.J. Hardy on the 15-day disabled list retroactive to June 7, 2010. Bone bruise in his left wrist. May 25, 2010 Minnesota Twins activated SS J.J. Hardy from the 15-day disabled list. May 11, 2010 Minnesota Twins placed SS J.J. Hardy on the 15-day disabled list retroactive to May 5, 2010. Left wrist contusion. September 1, 2009 Milwaukee Brewers recalled J.J. Hardy from Nashville Sounds. August 12, 2009 Milwaukee Brewers optioned J.J. Hardy to Nashville Sounds.